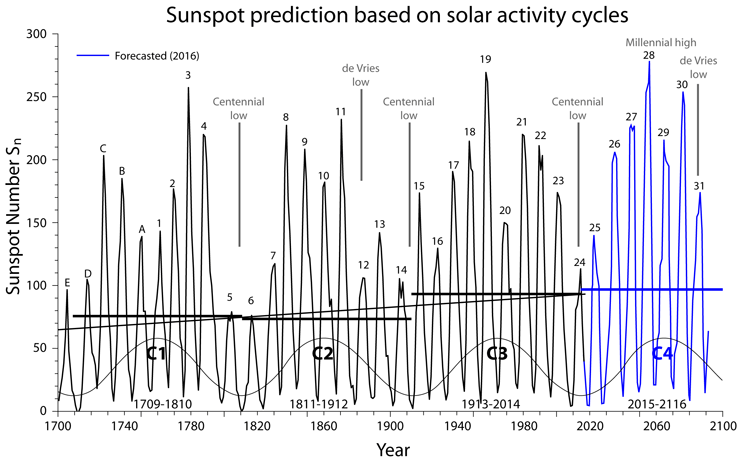 Solar scientist and part-time NSA operative Leif Svalgaard has produced a prediction for solar cycle 25, four years after Rick Salvador published his 86 year prediction in the swiftly censored “Pattern Recognition in Physics”. It appears at the end of a 30 page pdf document he has published on his website. This is an interesting document, with a wealth of gayly coloured butterfly diagrams, polar field reconstructions and more. Leif self deprecatingly follows his Prediction title with (At last) not only because it comes at the end of 30 pages of preamble, but because he’s acutely aware of his method’s limitations. The reason this prediction has arrived so late in SC24 is that the method it relies on can’t be applied until shortly before the minimum of the preceding cycle, and it only gives the ability to estimate the peak amplitude of the approaching cycle. It has nothing to say about the cycle length, or what comes after. It predicts that Solar cycle 25 will be higher than SC24 but lower than SC20. This is in sharp contrast to our orbital resonance theory, developed here at the talkshop, and distilled into a predictive model by Rick Salvador. In his 2013 PRP paper ‘A mathematical model of the sunspot cycle for the past 1000 years’, he gives a 100 year outlook prediction, which he recently re-scaled to match the new Clette et al numbering system when we discussed its progress recently. The model is performing well, and has alreading closely predicted the average amplitude and descent to minimum of SC24, currently occurring, with 90+ spotless days in the first half of 2018. If the late start to SC24 is repeated, we might estimate that SC25 will get under way during the next couple of years. It may run through to the early 2030s, subsuming the five year blip the model predicts between 2028 and 2037. Solar cycle 25 may be long and low. If the longer term outlook predicted by Rick’s model comes to pass, we are in for a prolonged solar ‘grand minimum’, which is already starting to have effects on Earth’s weather, with late and large hailstones falling across northern Europe and June snow in Scandinavia. He publicised that prediction on WUWT a few months ago, declaring that there would be no grand solar minimum 'this time around'. I queried him on it and got the usual dismissive reply. Well, he may be right. The Sun is hard to predict, especially when its activity is low. May the best hypothesis win. Leif is basing his amplitude prediction on the recent trend in the combined strength of the Sun’s polar magnetic fields and projecting that forward to his estimated time of SC24/25 minimum. Given how the south field already peaked and is currently declining, I think this is a somewhat risky strategy. Time will tell. BTW, as solar cycles are distinguished from each other by the change in polarity, I take it that the uncertainty about the ‘five year blip’ means that Rick’s predictions are unable to make that determination, only the length and strength of the cycle? It says here the ‘actual solar cycle minimum [is] likely to be sometime between April and December 2018’. Not sure when that was written but the latest sunspot image was added on 31st May. The solar magnetic cycle is not regular, and the individual cycle strength and duration vary cycle-to-cycle. The extreme example of this irregularity is the Maunder minimum in the 17th century when sunspot cycle went to a very low value. We explore the cause of this solar cycle irregularities using a novel 3D kinematic Babcock–Leighton dynamo model. This model is an updated version of the original model developed by M. Miesch and his colleagues. In this updated model, based on the toroidal flux at the base of the convection zone, bipolar magnetic regions (BMRs) are produced with statistical properties obtained from observed distributions. At the moment, our model doesn’t determine the time of polarity changes with any great certainty. The Sun can do surprising things. There might be a mix of polarities for a longer period than normal at that time. Ren, thanks.Your plot shows an upturn in recent south field data. 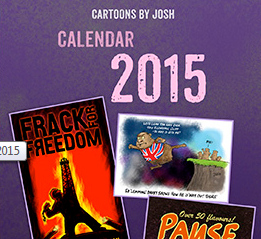 Is that part of an annual term that hasn’t been homogenised? Wilcox Solar Observatory data used in this study was obtained via the web site http://wso.stanford.edu courtesy of J.T. Hoeksema. From the end of May there is a large drop in the activity of the solar wind. 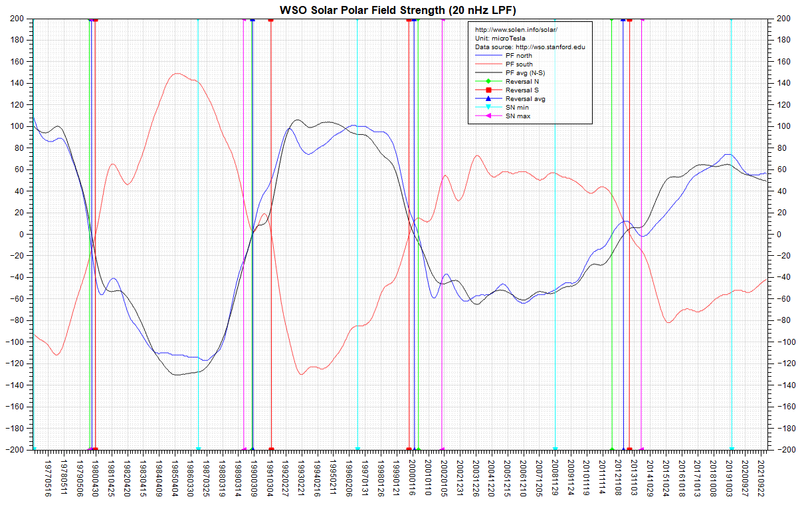 According to the unfiltered polar field strength, the first part of solar cycle 25 will be at least 10 percent stronger than cycle 24. The second part of cycle 25 can’t be calculated at the moment. I can’t give more details because my paper was found publishable by an important mathematical-physics journal, transferred and is now in peer review…. Congrats Patrick, good luck with the reviewers. Hi Javier. Thanks for this update and explanation of terms. While not mainstream orthodoxy, Gerry Pease discusses a syzygy pattern that he compares to SC24, 25. It suggests to me that ssn for SC25 wont start increasing until July 2021. Further, it wont peak until 2027. Fortunately, we will get answers soon for many theories. Do you know of any 20 or 30 year datasets that could support my belief that the Earth climate has been cooling since 2004? I saw one LOD chart showing a downward sawtooth trend, indicating cooling to me. A chart of 2.5 u dust particles should show an increase, but i havnt seen one. Canadian Prairie spring frost dates have been erratic for the last 10 years but no clear Trend yet. Any suggestion of other parameters to look at? It is interesting to me that my six year old Talkshop post does seem to support Svalgaard’s recent guess that SC24 minimum will be in early 2021. Notice that there were some interesting comments to my 2012 Talkshop post, including quite a few from “Ninderthana” (a pseudonym used by Ian Wilson at that time). He and Roger were both very interested in the Electromagnetic Link hypothesis. I first posted my prediction in 2016. It is based on solar activity cycles. My prediction for SC25 is that it should be like SC16, and agrees with Leif’s prediction. However I foresee high solar activity afterwards, unlike most people trying to predict future solar activity. This is just a centennial low and there is nothing more to it. The coming minimum should be in before the summer of 2019, but could be delayed up to the summer of 2020 and still it would not be an outlier. However, 2021 is really unlikely. Whatever happens, we are sure to learn from it. I think what is more important is how long sub solar activity continues rather then when one cycle ends and another begins. So what I am going to watch is how long the solar flux remains on average below 90. If I had to venture a guess I would say it will not crack 90 prior to year 2020. For the record what ever Leif says when it comes to solar/climate relationships I ignore. It is so off and antiquated. Six of the seven solar cycles between 1913 and 1996 lasted 10.5 years or less, so we’re due a few longer ones in theory at least, given the long-term average is supposed to be around 11.1 years. Of course with SCs the past is not necessarily a guide to the future, but the last one (SC 23) was 12.3 years. We’re now in the 10th year of SC 24. North Atlantic ocean heat content has been falling since 2005. There is no global warming due to AGW and the minor recent global warming that did take place is ending this year, year 2018. Thus far year 2018 is cooperating with overall sea surface temperatures now less then +.15c above 1981-2010 means in contrast to +.35c during the past summer. In addition according to satellite data the global temperatures this year are lower then a year ago through today. One key metric that has to be watched is the North Atlantic which is now in solid negative territory around -.60c from 1981-2010 means. As the sun continues in a prolonged solar minimum state this is going to equate to lower overall sea surface temperatures and a slightly higher albedo which in turn will equate to a colder climate. The weakening geo magnetic field will compound this . I have been saying this for years and this year 2018 , is the first year that my two solar conditions have been met in order to have the sun result in a more significant climatic impact. Those being 10+ years of sub solar activity in general(which started in year 2005) and within this sub solar activity in general a period of time of very low average value solar parameters(which started in year 2018) meaning solar reading equal to or lower in magnitude that occurs during typical solar minimums with the duration of time of these very low solar values longer then what is typical. It is happening this year and this is the first time since the ending of the Dalton Minimum, that my two solar conditions are occurring. In the meantime all the basic premises AGW theory is based on have failed to materialize while the global climate is not even close to being unique. The theory should have been trashed 20 years ago but has survived due to political agendas. Notice that he used inferred values of WSO DM, DM GN, DM SN and DM avg B min in his Table 1, They are all dependent on the “estimated” dates of preceding solar minima, which have all been previously estimated except for the last entry (SC25), Though he lumped that in with the other dates as “estimated,” he has never denied that it is anything other than a guessed time of minimum. It would be interesting to see what his prediction of SC25 max would be for solar minima on January 1 of years 2020 and 2019. He must have calculated those numbers, but has chosen not to reveal them even though the crucial date of the upcoming minimum is of much interest right now and his guess of Jan 1, 2021 is beginning to look like an outlier. 20 1964 8 1964.625 7.66 150 156 171 164 5. Table 1: Time of minimum for the numbered solar cycles. Average Group Numbers GN and Sunspot Numbers SN for the two highest yearly values for each cycle. DM (μT) observed at WSO for the three years prior to minimum, and the DM inferred from GN and SN, and their average, and finally the inferred HMF strength B (nT) at each minimum. Estimated values are in italics. My theory is so straight forward which is prolonged solar equates to overall lower sea surface temperatures due to less UV/NEAR UV LIGHT ,and a slightly higher albedo due to an increase in explosive major volcanic activity and an increase in global cloud/snow coverage. low solar /volcanic tie in -explanation. Read below what Theodore White has to say on this subject. Thanks Theodore for the great explanation which I believe is correct. The ‘mechanism’ Dave Burton is electromagnetic. All seismic activity such as earthquakes and volcanic eruptions are triggered by external pressures being forced on the Earth’s magnetic field. The stress that is put on Earth’s magnetic field begins at the ionosphere, which can be observed by the appearance of luminous phenomena very close to regions showing tectonic stress, seismic activity or soon-to-be volcanic eruptions. The connection between prolonged minimum and maximum solar phases to large magnitude earthquakes and increased volcanic eruptions is supported by overwhelming scientific evidence that is easily found online. There is strong statistical data which shows powerful correlations between major volcanic activity and numerous earthquakes of 8.0 magnitude or more on Richter scale to the Sun’s Grand Minimum states. Over the last several decades scientific papers began to appear that clearly show correlations between galactic cosmic ray and low solar activity with a rise of destructive geological events like earthquakes & volcanic eruptions. This has been supported by statistical evidence that extend back centuries. A 1967 study published by the Earth & Planetary Science Letters discovered that solar activity plays a significant role in the triggering of earthquakes. Then, In 1998 a scientist from the Beijing Astronomical Observatory, Chinese Academy of Science, also discovered a correlation between low solar activity and earthquakes. Additional research by The Space & Science Research Center found direct correlation between solar activity and the largest earthquakes and volcanic eruptions within the continental United States and other regions around the world. The study examined data of volcanic activity between 1650 – 2009 along with earthquake activity between 1700 – 2009 while utilizing solar activity data. The findings of study said that there was very strong correlation between solar activity and the largest seismic and volcanic events – worldwide. Moreover, the findings concluded that there was proof of a strong correlations between global volcanic activity among the largest of classes of eruptions and solar activity lows; with 80.6% occurrence of large scale global volcanic eruptions taking place during the Sun’s minimums and 87.5% occurring for the very largest volcanic eruptions during times of major solar minimums. We are entering such a period of a Grand Solar Minimum with the start of solar cycle #25 – due to begin anytime between now and the year 2020. When I forecasted back in 2006 that the world would enter global cooling just before the Sun entered its Grand Minimum and would see an ‘increase in large magnitude earthquakes and numerous volcanic eruptions, some conventional scientists derided me by saying that there was no physical mechanism. This, despite the fact that I named that mechanism – which is electromagnetic and penetration of galactic cosmic rays into our solar system. Then, two years later, in 2008, NASA announced that a close link between electrical disturbances on the edge of our atmosphere and impending earthquakes on the ground below has been found. The finding fell into agreement with additional scientific studies performed by other space research institutes. For example, orbiting satellites above the Earth picked up disturbances that were 100 to 600 kilometers above regions that have later been hit by earthquakes. Fluctuation in the density of electrons and other electrically-charged particles in the Earth’s ionosphere have been observed, and huge signals have been detected many times before large magnitude earthquakes struck. This is the physical mechanism that trigger earthquakes and volcanic eruption, but it is an ‘effect’ of what is happening where the Earth lives – and that is in outer space. For instance, on average, the flux of cosmic rays is 20 percent or more – higher during solar minimums. Tambora was in 1815, hence the ‘year without a summer’ in 1816. By the time the volcano finally subsided, Tambora had released an estimated one hundred cubic kilometers of molten rock as ash and pumice—enough to cover a square area one hundred miles on each side to a depth of almost twelve feet—making it the largest known volcanic eruption in the past 2,000 years. Whether it is at Leif’s prediction level or something lower, we are in for some testing times as this period of low solar activity will continue for some time. It should be a good test for cAGW proponents and their theories about ‘greenhouse gases’, (is the sun or CO2 the major driver of the planet’s temperature), and a test for the profiteers of ruinable electricity generation. It will certainly test our modern method of ‘just-in-time’ ordering and holding little in storage. I wonder if any government advisors are informing our leaders of the best course of action and contingency planning? It is interesting that Javiers forecast is very similar to mine. His is based on patterns from the past and mine is based on the solar angular momentum graph.